27 January 2014. Chemists at University at Buffalo in New York and Pennsylvania State University in Hazelton developed a sponge-like material that changes shape and color in response to ultraviolet (UV) rays. The team led by Buffalo’s Jason Benedict published its findings online last week in the journal Chemical Communications (paid subscription required). Metal-organic frameworks are chemical compounds that form into crystals that link inorganic and organic components. When links connect metallic components, the frameworks can result in porous crystals, with the voids comprising 50 percent or more of their volume. Science magazine in August 2013 counted as many as 20,000 such metal-organic frameworks studied in the past decade, some of which could store gases like hydrogen, methane, or carbon dioxide. Benedict and colleagues synthesized another metal-organic framework or MOF, this one also with sizable porosity, called BMOF-1 in the publication. However, the new factor in this material is the linking agent, from a class of compounds called diarylethenes, that gives the material its unique properties. The researchers report exposing BMOF-1 to UV rays changes the color of the crystal, a property known as photochromism, similar to eyeglasses that automatically darken when exposed to sunlight. Photochromism is a known characteristic of diarylethenes. The color change, say the authors, indicates the electronic properties of BMOF-1 are affected by UV rays, which could influence the kinds of materials stored in the crystal’s porous openings. The shape-changing property of diarylethene linkers seems to work only when closing, not opening, in BMOF-1 crystals. When on its own, say the authors, diarylethene can change shape into an open position after exposure to white light. When linking components in BMOF-1, however, diarylethene appears only to close, not open, when exposed to white light. The researchers plan to focus on this shape-changing property in the next step of the research. 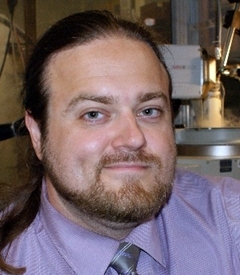 The university says Benedict is one of 50 materials scientists on the Buffalo campus taking part in the New York State Center for Excellence in Materials Informatics that collaborates with industry to develop advanced materials for applications such as energy efficiency and medical devices.